This article supports the contention made by George Preston Marshall’s granddaughter several decades later. This entry was posted on May 6, 2013 at 7:07 pm and is filed under Football, Haskell Institute, Lone Star Dietz. You can follow any responses to this entry through the RSS 2.0 feed. You can leave a response, or trackback from your own site. This is a great find. It suggests to me that the team’s name might have been changed to something else, except for the fact that Marshall was planning to put on the field an “Indian” team, coached by a Native American and featuring several Indian players. Given this intention, what other name could Marshall have chosen other than Redskins? A team named the Cleveland Indians had played in the NFL in 1931, and by 1933, the name Indians was so closely associated with the city of Cleveland that Indians wasnt really an option. With Braves and Indians out of the running, Redskins was probably the most logical name available. especially since there was no well known tribal name with strong Boston associations. 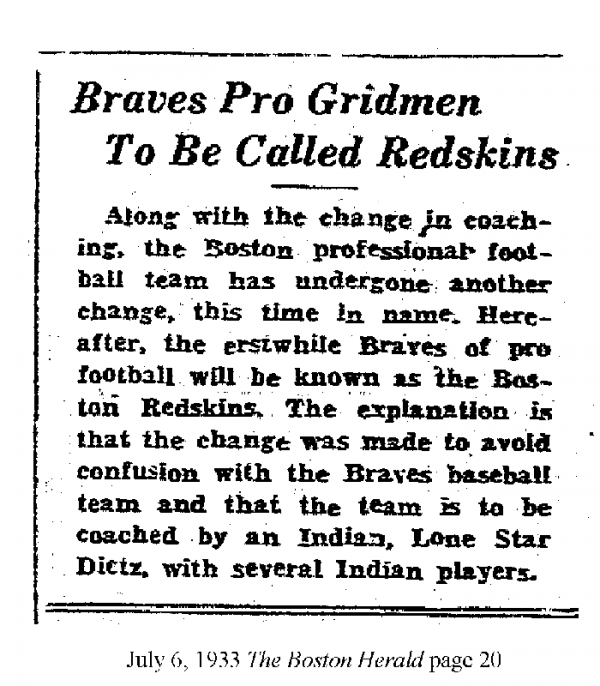 The other available names, Chiefs, Scalpers, Savages–all used by other pre-1933 football teams–were not nearly so attractive as Redskins, particularly given aural similarities of Red Skins and Red Sox. Had Dietz not been the coach, Marshall might have named the team the Pilgrims or Patriots but definitely not Cowboys.